the original inspiration was a visit to the alhambra 15 (!) or so years ago. i fell in love with the decoration, the colour, the use of light and space. that trip to spain and morocco influenced my use of hard landscaping materials in our little garden. when the option modules came up i figured i could take my interest in origami tessellations a step further exploring islamic tile patterns. i knew they could be translated into fabric and since this was a textiles workshop-based course that seemed like a good direction to take. then i saw fannie van arkel’s work and realised she did it better than i ever could 😀 so i returned to the paper side of things. we’d constructed some paper models for translating into fabric manipulation, but the quality of those models really inspired me – that simple straight cuts and folds could bring the flat paper to life, give it a more organic form. 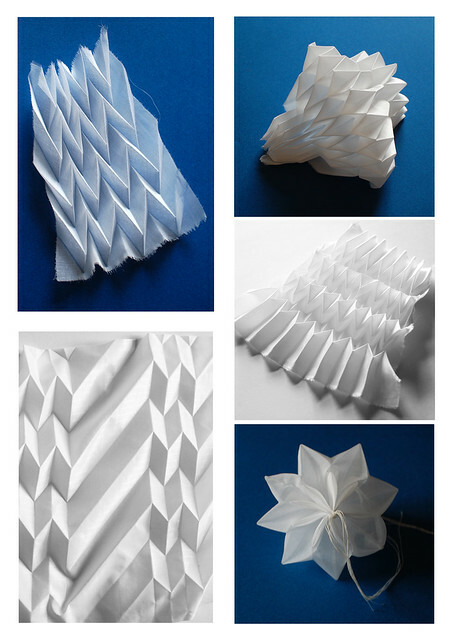 it reminded me of a) the sculptural qualities of geometric tile patterning – that skilled designers can map a pattern constructed with straight lines to fit onto curved domes – and b) my previous experiments with pleat tessellations following the techniques of goran konjevod. i’m pleased with these – each uses the same simple technique but i’ve managed to improvise patterns and to some extent predict how a particular fold pattern will come out. i should have taken more pictures of the pieces backlit and/or used more translucent papers to show off the technique best. 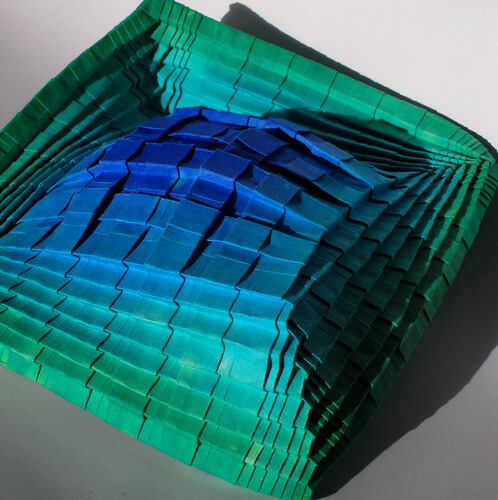 i developed these models into a larger 32-grid piece. i really should have looked up issey miyake sooner. not only does he have an entire clothing line based on simple pleats he also creates lanterns reminiscent of the paper folding xmas decorations we had as kids in the 70s. 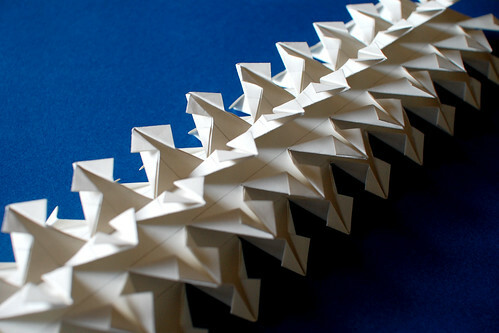 and he uses a very simple technique to make the pleats – simple if you’re a reasonably confident paper folder – two matching pleated paper patterns with the fabric sandwiched between and heat setting the pleats. 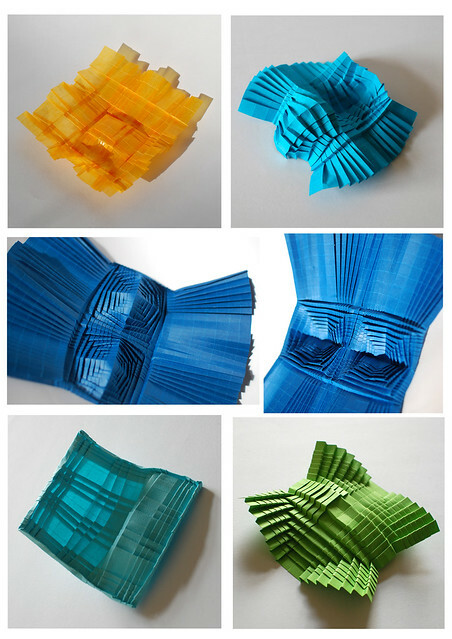 i adapted some of my previous models and improvised patterns on the same basic prefold grids. my pleats aren’t permanent since they’re just ironed flat. 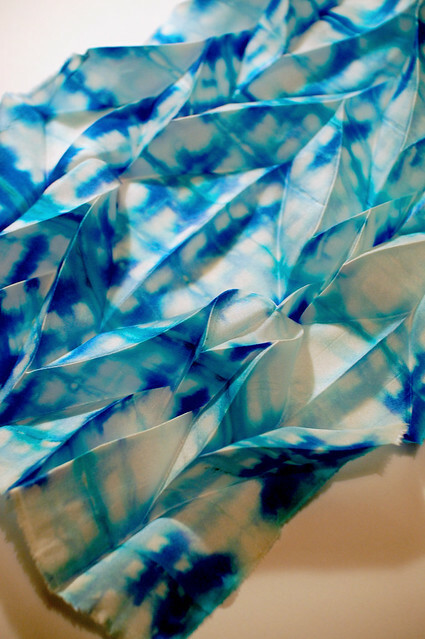 i used these techniques on a larger piece that i shibori dyed (in itself a geometric, folding process) using clothes peg resists. 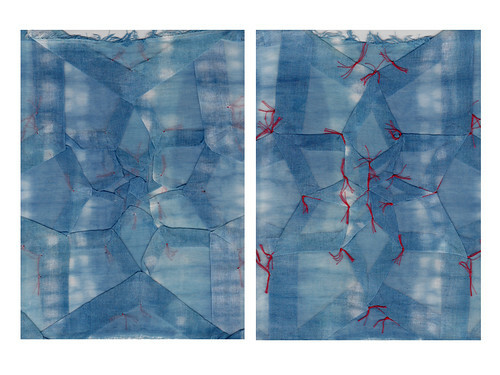 i think my attempt to create a soft drape out of straight lines was successful in this piece. all this prefolding on a grid brought me back round to examining the underlying geometry of the tile patterns that originally inspired me, probably the most rewarding part of the module. 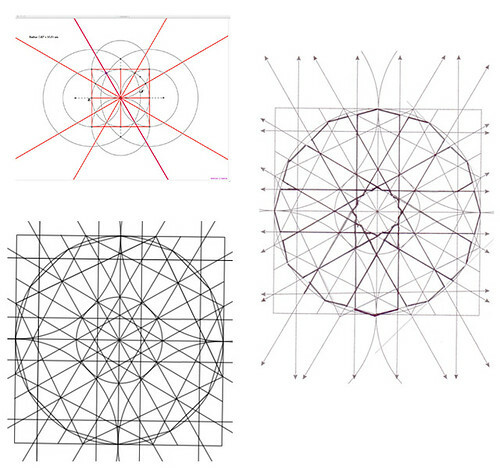 i drew templates for 8- and 12-point symmetry squares by hand and with software (Geometer’s Sketch Pad 5 – 1 year licence under £10, recommended) and mapped tile and screen patterns. never one to miss the chance to do some hand paper cutting i made a small box using the mapped patterns and one i drafted on the basic 8-point base. 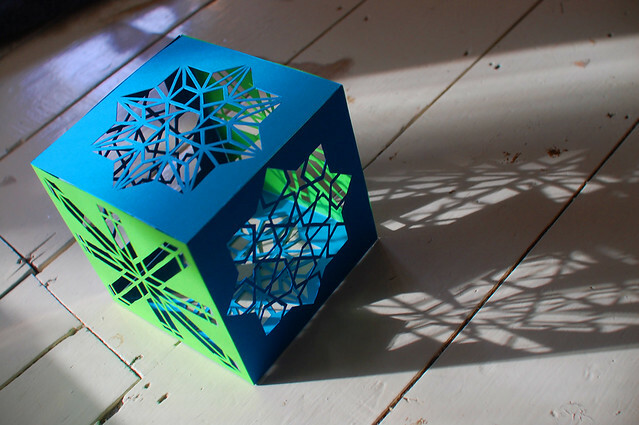 this was also inspired by the craft skill and patterning of islamic carved jali screens. 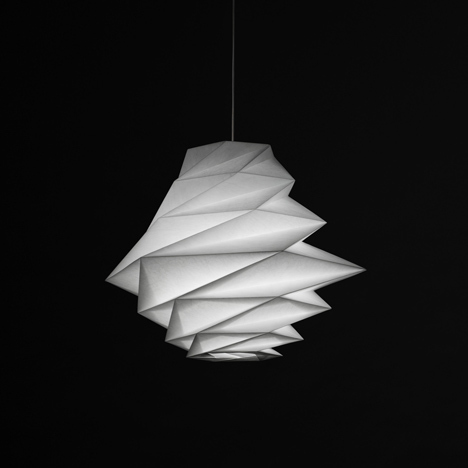 this really needs a light inside, and could translate well into laser-cut materials.